Every year the boys of Cub Scout Pack 65 in Haddonfield have a flower sale to raise funds for the Pack. As the Pack has grown and gotten stronger the flower sale has been increasingly successful. Last year the boys set an extra goal for themselves to raise funds for a worthy local charity. In partnership with the Pack’s host organization, the Haddonfield United Methodist Church, UrbanPromise was selected. As part of the Pack’s first meeting of the 2014–2015 year the Pack presented volunteers from Urban Promise with a check for $500. The Pack’s top four flower salespeople had the honor of presenting the check. UrbanPromise has six after school camps and nine summer camps in the city of Camden where we keep 600 children and youth safe, engaged and spiritually nurtured. Each day of camp is filled with joy and excitement — even during homework time! To learn more about UrbanPromise visit their website www.urbanpromiseusa.org/home or contact Jennifer Giordano, Church and Community Relations Director, at (856) 382–1864 or jgiordano@urbanpromiseusa.org. Cub Pack 65’s donation will allow for another student to participate in Urban Promise’s afterschool programs. Pack 65 has over 80 boys involved from first through fifth grade. The Pack’s mission is to teach ethics and life skills through hands on outdoor and civic related activities. 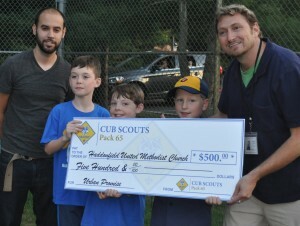 To learn more about Cub Scout Pack 65 visit cubpack65.com or email Cub Master Pete Westover at cubpack65@gmail.com.